Responding quickly to aggravation, threat, insult, or difficulty suggests strength to many folks today. However, responding hastily out of anger is foolish. This response seldom produces the desired long term effect and nearly always compounds the problems that need to be addressed. Patiently dealing with frustrating and painful situations shows understanding and is nearly always more fruitful in the long run. 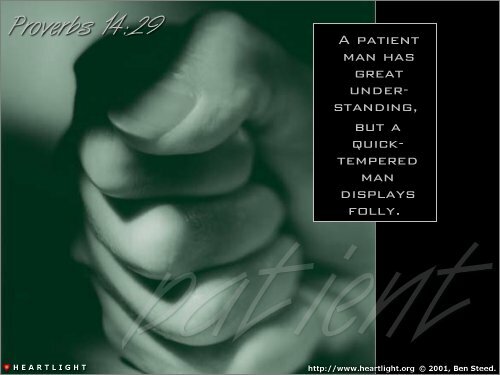 Father, I ask for patience and self-control. I know these virtues are part of the fruit of your Spirit's presence in my life, so I ask that the Holy Spirit have more impact on my heart and life. Please give me the understanding and wisdom to keep my mouth shut until I have had an opportunity to pray and think about the issues and people involved involved. In Jesus' name I pray. Amen.